For general information on organisations of this name, see Food cooperative. Co-op Food, previously branded as The co-operative food, is a brand devised for the food retail business of the consumer co-operative movement in the United Kingdom. When looking at food retail, the brand is commonly understood to represent one food retail business, though this is not true as it is used by over 15 different co-operative societies which operate over 4,000 outlets. Successor to Co-op Welcome and a range of regional formats, the latest version of the brand was introduced in 2016 with a significant advertising campaign. Customers of many of the larger UK cooperative societies can earn an annual share of the profits at any "Co-operative" branded stores in proportion to purchases through The Co-operative Membership scheme. In 2016, The cooperative food accounted for approximately 6.6% of the UK grocery market and was the winner of "convenience retailer of the year" at the 2016 Retail Industry Awards. 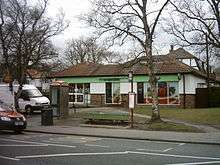 A Co-operative Food store in Lawnswood, Leeds. A Co-operative Food branded Esso petrol station and convenience store in Northallerton. Whilst the UK co-operative sector's market share of food retail has diminished from a peak of 30% in the 1950s to just 6.4% today, the largest business in the UK co-operative movement - The Co-operative Group - remains the fifth largest food retailer in the United Kingdom. The "Co-op" brand is used by over 3,500 stores owned by the various societies which make up the co-operative movement, including the Central England Co-operative and the Midcounties Co-operative, but the brand is most associated with The Co-operative Group as it operates significantly the largest number of stores. A number of co-operative societies including Scotmid and the Lincolnshire Co-operative do not use the standard brand, preferring instead to use the 1992 'cloverleaf version' of The Co-operative brand. In 2016, The Co-operative Group reverted to the use of its 1968 Co-op cloverleaf branding. Co-op stores are of various sizes incorporating convenience stores and supermarkets, and the brand has the biggest geographical spread of any retailer, with a store in every postal region of the UK. The vast majority of products sold in "Co-op Food" stores are sourced collectively through the Co-operative Retail Trading Group although stocking decisions and pricing are determined by the individual businesses. The Co-operative Group, which manages the 'Retail Trading Group' took the decision not to compete head-on with the Big Four supermarket multiples purely on price in a market that was becoming ever more competitive. The co-operative movement has largely decided to concentrate instead on smaller convenience stores in local communities and also to market the "co-operative difference" and the ethical stance that the Retail Trading Group has taken on sourcing, having long been a supporter of Fairtrade, renewable energy and higher animal welfare standards. Though often considered to be one supermarket business, The Co-operative Food is a network of supermarkets and convenience stores owned and operated by over 15 independent co-operative societies, many of which have adopted the 2008 version of The Co-operative brand. In total there are over 4,000 co-operative foodstores in the UK, more outlets than any other grocer. The table below indicates how many foodstores each co-operative society operates. The Co-operative Food is widely recognised for its commitment to responsible and ethical trading, particularly for championing fairtrade in the UK. These commitments and its mutual structure led to The Co-operative Food being awarded Ethical Consumer Magazine's 'Best Buy' status in 2011 and 2014. This section only refers to sourcing initiatives for food sold through the Co-operative Retail Trading Group and more information on the commitments of individual co-operative societies can be found on their respective pages. The Co-operative Food was the first major UK retailer to stock Fairtrade products and was the first UK supermarket to sell fairtrade coffee (1992), bananas (2000), own-brand chocolate (2000), own-brand wine (2001), sugar (2005) and blueberries (2010). Since then, all own brand block chocolate (2002), coffee (2003), sugar (2008), bananas (2012), winter blueberries (2012) has been converted to fairtrade. The Co-operative Food is also the largest UK retailer of fairly traded wine and has the largest range of fairtrade products in the UK. The business has also been recognised for working with many co-operative and smallholder farmers, including providing investment funding to enable farming co-operatives who supply them to convert to fairtrade certification. In 2014 its fairtrade sales were £133m. The Co-operative Food is one of the leading retailers of responsible fish in the UK having launched its Responsible Fish Sourcing Policy in 2008 after commissioning research in association with NGOs, academics and its suppliers. The Co-operative Food was commended by the Marine Conservation Society with a 'gold award' (2011) and a 'silver award' (2013) and, for its sourcing policy, The Co-operative was one of five organisations accredited with the 2010 Seafood Champion Award. Their fish sourcing policy specifies that no fish sold by The Co-op can be found on the Marine Stewardship Council's 'Fish To Avoid' list, all own brand tuna must be pole and line caught and own brand farmed salmon is certified by the RSPCA. In 2015 the co-op became one of the first retails to join the 'Ocean Disclosure Project' which requires the business to report transparently on the geographic locations, fishing methods and sustainability characteristics of all of the fisheries from which they source. This move confirmed an ongoing commitment by The Co-operative Food in promoting transparent and responsible fishing in the UK. All Co-operative own-brand health, beauty and household products are marked with an "approved by BUAV" rabbit symbol to show that neither the product nor its ingredients have been tested on animals. This has been the case since 1985 and 1997 for toiletry and household products respectively. For a number of years The Co-operative Food has sourced approximately 98% of its electricity from renewable sources, of which 12% they generate themselves and another proportion is sourced from community energy projects supported by 'The Co-operative Enterprise Hub'. The Co-operative Food donates money from the sale of bottled water and carrier bags to various charitable causes with over £5m awarded since the project started. Projects which have been funded included clean water projects in Africa and emergency funding for the 2015 DEC Nepal Earthquake appeal. A strong British sourcing policy has been central to The Co-operative Food for a number of years. In 2014, all fresh beef, butter, cheese, chicken, duck, eggs, ham, milk, meat pie fillings, meat sandwich fillings, pork, turkey, sausages and salmon were sourced from within the UK. The business has pledged that all in season potatoes, carrots, cabbage, swede, onions, parsnips and lamb will be British by 2018. The Co-operative Food brand is a part of the larger national The Co-operative brand which was last updated in 2008. According to Catherine Charnock of Co-operative Brands Ltd., The Co-operative Food was given a green identifying colour distinguishing it from other co-operative business sectors (such as pharmacy, banking, travel and funerals) and from the previous blue livery. However, the company re-branded in May 2016, with all areas of the company returning to the original blue 1968 Co-op 'cloverleaf' design. Many Co-op Food stores use the in-store "Co-op Radio" which is produced and broadcast by Mood Media Since 2015, Scotmid has provided its own 'in-store radio'  on behalf of The Co-operative Group. Co-op Food Supply Chain Logistics is the distribution business of The Co-operative Group that manages the national and international distribution of goods on behalf of all the food retailing co-operative societies who are members of the Co-operative Retail Trading Group. The Co-operative Group manages all of its own logistics and virtually all of its delivery operations, although several distribution centres use 3rd party logistics partners to manage their transport operations. Supply Chain Logistics Head Office is co-located at the Birtley Distribution Centre. Co-op Food Supply Chain Logistics has 8 regional composite distribution centres and 3 smaller satellite depots supporting the larger CDCs. The Coventry-based National Distribution Centre (NDC) supplies all distribution centres direct, with slow moving lines. Members of The Co-operative Group and participating regional societies earn one membership point for every £1.00 spent at The Co-operative Food. Points are converted into dividend at a rate agreed annually by the Board. In September 2016, The Co-operative Group launched a new meaningful membership, which means when a member purchases Co-op products and services, 5% of the money will come back to the member, and 1% of the money spend will go to the member's local community through community partnerships. This membership spans the Food business, Funeralcare and is intended to extent to Insurance. ↑ Central England Co-operative: Our Annual Review 2015/16 (pdf) (Report). Central England Co-operative. 2015. Retrieved 11 April 2016. ↑ "Half Yearly Report for the 6 months ended 7th March 2015" (pdf). Lincolnshire Co-op. Retrieved 4 January 2015. ↑ "Lincolnshire Co-operative reports growth in food, travel and pharmacy". Retrieved 25 July 2015. ↑ "About Us". Retrieved 25 July 2015. 1 2 "The Co-operative". Retrieved 25 July 2015. ↑ "Our Fairtrade products & stories". Retrieved 25 July 2015. ↑ "Fairtrade gets huge boost from The Co-operative's new ethical plan". the Guardian. Retrieved 25 July 2015. ↑ "The Co-operative named worldwide seafood champion". Retrieved 25 July 2015. ↑ "Ocean Disclosure Project 2015" (PDF). The Co-operative Food. Retrieved 21 December 2015. ↑ "Reducing our impacts - fish sourcing". Retrieved 25 July 2015. ↑ "Our Charity Partnership - The Co-operative". Retrieved 25 July 2015. ↑ "Fairbourne Springs water projects". Retrieved 25 July 2015. ↑ Born and Bred: A report into The Co-operative Food’s UK-wide sourcing (pdf) (Report). The Co-opertive Group Limited. Retrieved 26 January 2016. ↑ "Co-operative Radio shows sales increase up to 40% at moodmedia.co.uk". Retrieved 25 July 2015. ↑ "Scotmid warns of 'challenging market' despite sales boost". TheGrocer.co.uk. Retrieved 25 July 2015. ↑ "2015 Winners by Retailer - The Grocer Own Label Food & Drink Awards". Retrieved 25 July 2015.